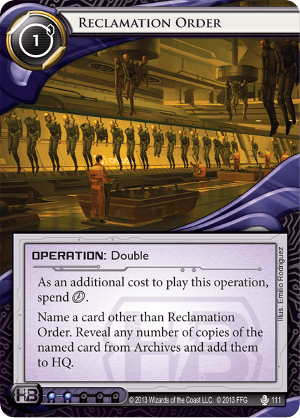 Name a card other than Reclamation Order. Reveal any number of copies of the named card from Archives and add them to HQ. This card tends to see play in NBN kill decks such as the Near-Earth Hub: Broadcast Center Butchershop variant. Its primary use is to recycle kill cards back to hand, such as Scorched Earth and Traffic Accident. This may prove necessary if the runner defends the first kill attempt(s) with Plascrete Carapace or I've Had Worse, or alternatively if programs such as Imp are used to trash the kill cards directly from runner accesses. In these situations the runner may anticipate that the required kill pieces are unavailable and become more carefree with regard to tags. Although Jackson Howard can perform a similar service, he shuffles cards back to R&D and is therefore not as efficient at this particular task as Reclamation Order. Another utility of the card comes if you are "kill card and agenda" flooded in the early game without yet seeing Jackson Howard. In this situation you may need to trash the kill cards temporarily for later retrieval- this is often a better option than installing or trashing agendas to create hand space.